Fully updated to include Excel 2010, Get Started in Excel explains all the key aspects of this application from the user's angle. 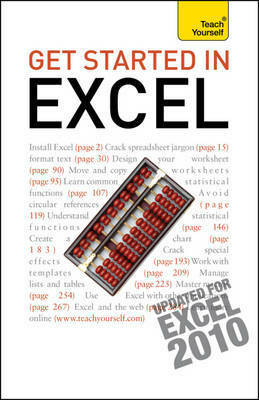 With step-by-step instructions, minimal jargon and detailed explanations of all the technical terms and written in a clear and enthusiastic style for the new user at home or in the office, it covers all the key features of Excel and helps you to maximise your use of the system with confidence. NOT GOT MUCH TIME? One, five and ten-minute introductions to key principles to get you started. AUTHOR INSIGHTS Lots of instant help with common problems and quick tips for success, based on the author's many years of experience. EXTEND YOUR KNOWLEDGE Extra online articles at www.teachyourself.com to give you a richer understanding of the basics of Excel. THINGS TO REMEMBER Quick refreshers to help you remember the key facts. Moira Stephen is based in Edinburgh, Scotland, and has written many computer books. A consultant and a college lecturer in further and higher education, she has many appreciative readers of her clear, practical guides to computing.